Blind scorpions that live in the stygian depths of caves are throwing light on a long-held assumption, showing that specialized adaptations aren’t always an evolutionary dead-end. 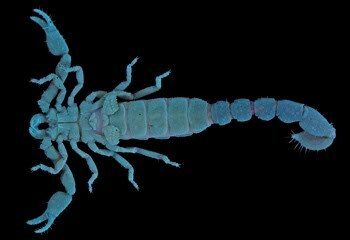 Looking at the phylogenetic relationships among species of the scorpion family Typhlochactidae, endemic to Mexico, Associate Curator Lorenzo Prendini and colleagues found that species currently living closer to the surface (under stones and in leaf litter) evolved independently on more than one occasion from specialized deep-cave ancestors adapted to life further below the surface (in caves). This finding puts a dent in both Cope’s Law of the unspecialized, which assumes that novel evolutionary traits tend to originate from a generalized member of an ancestral taxon, and Dollo’s Law of evolutionary irreversibility, which theorizes that specialized evolutionary traits are unlikely to reverse. Scorpions are predatory, venomous, nocturnal arachnids related to spiders, mites, and other arthropods. About 2,000 species are distributed throughout the world, but only 23 species found in ten different families are adapted to a permanent life in caves. One of these families is the Typhlochactidae, comprising four genera and nine species.